Give Strength. Give Hope. Give Courage. You can make a difference in a child's life by donating to a child you know and love, by donating to a child who is on our waiting list, or by signing up to become a sponsor of an event. Want to contribute but don't know a child to nominate? Children on the waiting list are waiting for a sponsor just like you! Donate to one of the many children on our waiting list. It can take up to 6 months for us to connect a superhero with a sponsor. Already have a hero in mind? Nominate a child, donate $30 today, and the cape will be shipped in 2 weeks. If you would like to donate a cape to a specific child, please select the donate button below and then specify their name in the message field on the Paypal payment page. ***If you would like to donate a cape to a child you nominated, please select the donate button below and then specify the child's name in the "Message" field on the Paypal payment page. Your donation allows one (1) superhero to receive their very own cape. Your donation allows ten (10) superheroes to receive their very own capes. 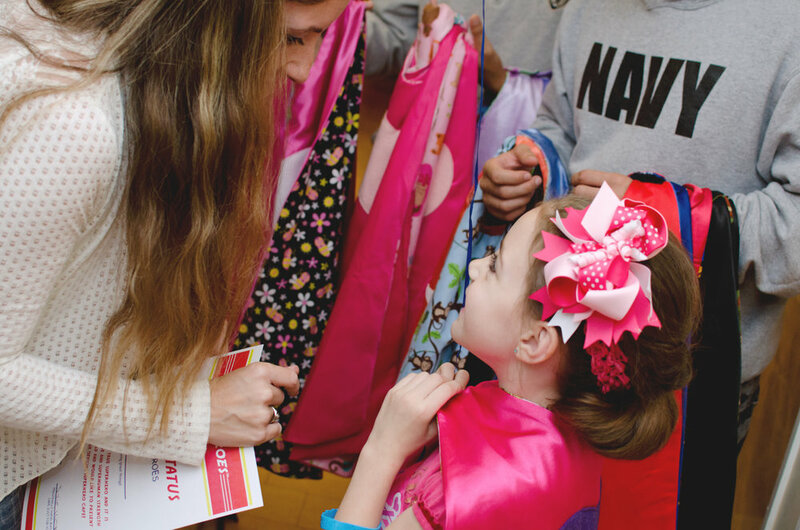 Your donation allows thirty (30) superheroes to receive their very own capes. You Choose the Amount - Your donation goes to support the delivery of superhero capes to children. Membership is monthly and will give 12-36 different children their very own cape! "Neleh-Kate loves her cape!! Thank you!!" -Dan.